Henry Johnson, the 5th governor of Louisiana, died on September 4, 1864. Born in Tennessee on September 14, 1783, he became an early advisor and friend of W. C. C. Claiborne when Claiborne was governor of the Territory of New Orleans. Claiborne, knowing that he was seriously ill, appointed his friend Henry Johnson as executor of his will. All of the historic papers and journals of W. C. C. Claiborne remained with Henry Johnson until the son W. C. C. Claiborne II became of age. Henry later became a friend of W. C. C. Claiborne II and the godfather of his son George W. Claiborne, who was killed at the Battle of Mansfield, La. in the Civil War. Henry left a considerable sum of money to this godson in his will. Henry's will was revised after the war was over, so he may not have known of this death. Henry also willed money to his friend Bishop Polk, who was also killed in the Civil War. 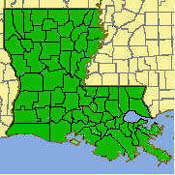 By 1814, Johnson was in Donaldsonville, La. practicing law after becoming a member of the Virginia Bar. He was a very early resident of Donaldsonville which had a population of only 317 in an 1817 census. A daughter, Emily Louisa Johnson, was born May 4, 1838 and died December 6, 1839. She is buried in a tomb in St. Joseph Catholic Cemetery in Thibodaux. Also buried in this tomb is the governor's sister-in-law, named Louisa Emily Key, who died March 6, 1830, the governor's brother-in-law, Phillip Barton Key, and nephew, William Thompson Key. Pictures of their tomb are on the next page. A boy named Henry Johnson was attending school at Georgetown, Maryland in 1838, when ex-Gov. Henry Johnson bought 148 slaves from the Jesuits for himself, ex-Governor Henry Thibodaux, Jesse Batey and possibly others. The attached article, The Jesuits' Slaves, states that this student is the son of Louisiana Governor Henry Johnson. Governor Johnson was at that time a U. S. Representative in Congress. His wife, Elizabeth Key Johnson, was from a prominent family that lived in D. C. They would likely have lived in that area. Ms. Lynn Conway, Georgetown University Archivist, states that the entrance book lists the student Henry Johnson as the son of Henry Johnson of Washington City. If this is the son of Governor Henry Johnson of Louisiana, it is the only record found of a son. 1 - He represented St. Mary's Episcopal Church, located in Bayou Goula, in the Councils of the Diocese, probably in its early years when Rev. Henry T. Lee was rector from May 28, 1851 until 1853. This church was about 10 miles upriver from his Chatham Plantation. 2 - He was a founding member of Episcopal Church of the Ascension in Donaldsonville, even donating the land and buildings for the first church and school on August 29, 1852. 3 - He was a founding member of the Episcopal Church of the Nativity in Rosedale, representing it in the State Episcopal Convention on May 6, 1859, when the church was accepted into the Episcopal union. He and Elizabeth are recorded as participants in the Christmas services of 1858. 4 - He was a founding member of the Calvary Episcopal Church in New Orleans in 1860. 5 - He resigned the Episcopal Church of the Nativity about 1861 to join the newly formed Calvary Episcopal Church in Livonia, which was closer to his home. The Rev. Henry T. Lee was rector of that church. Henry T. Lee, clergyman, was in the home of Gov. Henry Johnson in the 1860 census. 6 - He signed a resolution proposing that the Diocese of Louisiana enter into union with other dioceses to form the Protestant Episcopal Church in the Confederate States of America which was then passed by the Convention of the Diocese of Louisiana in 1861 in St. Francisville. 7 - In his Last Will & Testament he donated money and land for the construction of a new Episcopal Church adjacent to the upper boundary of his plantation. He also left a gift to the Children's Home of the Episcopal Church of New Orleans. Henry Johnson's wife, Elizabeth Rousby Key, of Maryland, is the granddaughter of George Plater III, the sixth Maryland governor from 1791-1792 who died in office. George Plater III was a founder and then a member of St. Andrew's Episcopal Church for 28 years. 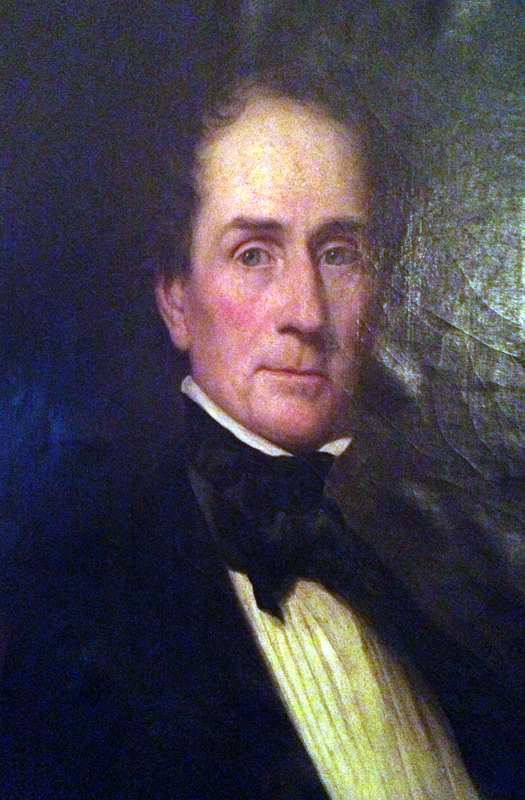 Elizabeth's father, Philip Barton Key, represented Maryland in Congress from 1807 to 1813. Elizabeth Rousby Key is also the first cousin of Francis Scott Key, author of "The Star Spangled Banner". Elizabeth's brother, also named Philip Barton Key, also moved from Maryland to Louisiana. He had a large family on Acadia Plantation, the location of present day Nicholls University in Thibodaux. This Philip Barton Key died in 1854, causing his wife and children to move to Rosedale, La, closer to Henry and Elizabeth who owned Woodley Plantation near Livonia. Of ten Key children, one was named Henry Johnson Key, one was named Elizabeth Rousby Key. and another was named Francis Scott Key. Today there are not any headstones or other sign of a burial in this area. The plantation is now a soy bean farm with few trees and certainly not a garden. This area can be seen in pictures of Woodley Historic Plantation Cemetery. In 1935 a great great nephew gave a statement that the governor had been temporarily buried at "woodly (sic) plantation" and reintered in Donaldsonville. There is no evidence of this in the cemeteries of Donaldsonville. If this happened, it would have had to occur between 1915, when his grave site was visited (see Search for Money - 1915) and 1935, the date of this reinterment report. By 1915, Henry Johnson had been buried for 51 years. A reason for reinterment and a caring person at this point is hard to imagine. Additionally, a grave site, less than 100 years old in Donaldsonville, should be easily found, but has not been located. The Last Will & Testament of Henry Johnson states very plainly that he wished to have a "substantial Tomb of Stone" on property to be donated for a new Episcopal Church adjacent to the upper boundary of his plantation. This important requirement in his will was not satisfied. His initial tomb may have been of minimal construction in anticipation that it would be replaced by the "substantial Tomb of Stone". 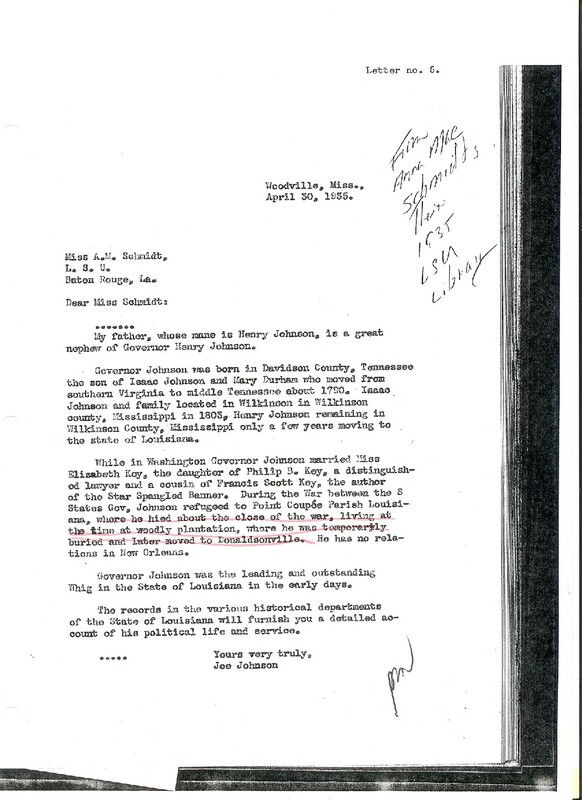 There was a lot of litigation between a Stockett relative from Woodville and the executor of Henry's will, his nephew Joseph Johnson, over property disposal. The succession occurred immediately after the civil war. Some recipients in the Johnson will received only 38 cents on the dollar. Others received even less. It may be that there was not money left to build the "substantial Tomb of Stone".